The Scott Naturals Scented Moist Wipes Pop-Up Refill contains wipes with natural aloe Vera to leave you fresh and clean. They break up after being flushed. 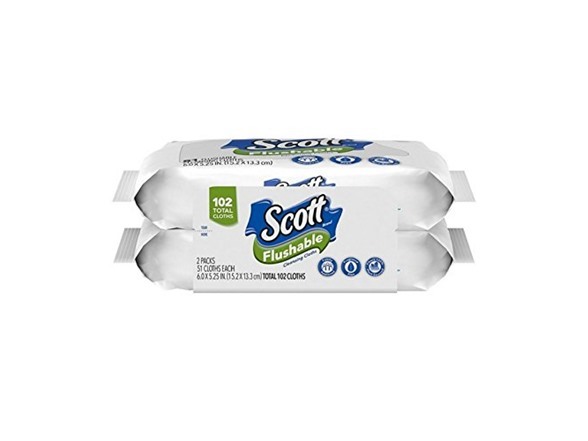 These Scott Naturals flushable wipes are safe for the environment. They are made from 100 percent sustainable resources and are free of alcohol and dyes. This package contains 102 moist wipes. Take a green step without sacrificing quality with Scott Naturals Flushable Cleansing Cloths. Made from 100% sustainable resources, Scott Naturals moist wipes give you a fresher, cleaner feeling than you can get from dry tissue alone. Scott Naturals wipes have no alcohol or artificial dyes, so they're safe to use on even the most sensitive skin. And because they're made with Safe Flush Technology, they help protect sewer and septic systems, too. Make Scott Naturals Flushable Cleansing Cloths a part of your everyday bathroom routine, and do something good for yourself and the environment. Ingredients: Water/Aqua, Sodium Chloride, Sodium Benzoate, Amodimethicone, Phenoxyethanol, Malic Acid, Sodium Lauryl Glucose Carboxylate, Polysorbate 20, Lauryl Glucoside, Fragrance, Sorbic Acid.